Artefacts revealed by melting ice patches in the high mountains of Oppland shed new light on ancient high-altitude hunting. Enter the glacial archaeologists – specialists who rescue now-threatened artefacts and study the relationship between variability in climate and the intensity of human use of alpine landscapes. Focusing on Jotunheimen and the surrounding mountain areas of Oppland, which include Norway’s highest mountains (to 2649m), an international team of researchers have conducted a systematic survey at the edges of the contracting ice, recovering artefacts of wood, textile, hide and other organic materials that are otherwise rarely preserved. By statistical analysis of radiocarbon dates on these incredibly unusual finds, patterns began to emerge showing that they do not spread out evenly over time. Some periods have many finds while others have none. What could have caused this chronological patterning – human activity and/or past climate change? These questions are the focus of a new study published today in Royal Society Open Science. “One such pattern which really surprised us was the possible increase in activity in the period known as the Late Antique Little Ice Age (c. 536 – 660 AD)," says Dr James H. Barrett, an environmental archaeologist at Cambridge's McDonald Institute for Archaeological Research and senior study author. "This was a time of cooling; harvests may have failed and populations may have dropped. 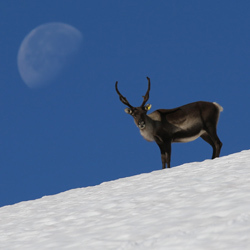 Remarkably, though, the finds from the ice may have continued through this period, perhaps suggesting that the importance of mountain hunting (mainly for reindeer) increased to supplement failing agricultural harvests in times of low temperatures. Alternatively, any decline in high-elevation activity during the Late Antique Little Ice Age was so brief that we cannot observe it from the available evidence. “We then see particularly high numbers of finds dating to the 8th – 10th centuries AD, probably reflecting increased population, mobility (including the use of mountain passes) and trade – just before and during the Viking Age, when outward expansion was also characteristic of Scandinavia. "One driver of this increase may have been the expanding ecological frontier of the towns that were emerging around Europe at this time," says Barrett. "Town-dwellers needed mountain products such as antlers for artefact manufacture and probably also furs. Other drivers were the changing needs and aspirations of the mountain hunters themselves."